When you’re stuck staring at the grey lens shutter graphic for 5 to 10 seconds before you can even take a picture, you’ve likely already missed the shot you were hoping to get. Obviously the quickest way to access the iPhone camera is using the lock screen camera swipe instead of manually launching the Camera app, but what if both methods take a long time to open? 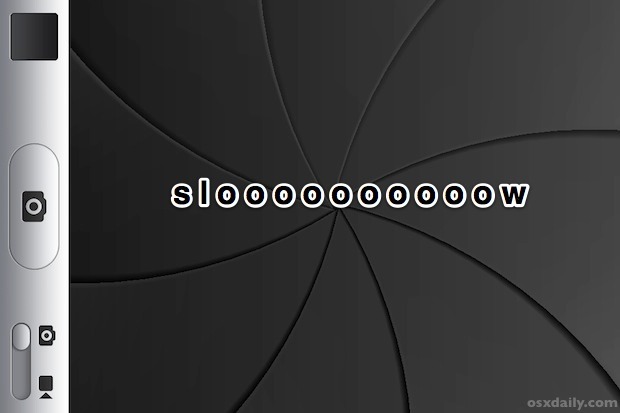 If you constantly find yourself looking at the lens shutter graphic and waiting forever for the slow camera to load, all you need to do to speed up Cameras launch is delete all the iPhone photos. How you clear out the pictures is up to you, though it’s fastest if you connect the iPhone to a computer and delete them from there rather than deleting them in iOS itself. Also, if you establish a USB connection you can easily transfer all the pictures to the computer before ditching them all, which is certainly worthwhile if you have pictures you care about. By clearing out the Camera Roll, you’ll dramatically speed up the launch time of the Camera app. Why does this work? Maybe because it’s not loading thumbnails or having to calculate the number of pictures stored on the device, who knows, but it seems the more images you have stored in Camera Roll the slower the Camera app takes to load. This is a problem that is felt much worse on the gradually aging hardware of iPhone 3GS and iPhone 4, so trim back on the stored images and get your speed back. “You can find the file your are looking for much faster by deleting all the other files and storing only one file on your computer. How is it a stupid solution? If you have loads of photos in the camera roll the camera application has to generate thumbnails etc for them. Or, just do what I do, download all photos and videos from the phone to a folder on your computer, set iTunes to sync them back. Result, camera roll constantly empty, all iPhone photos still on the phone. Does it really make a difference if it’s in the Camera roll or a Image folder? Clever solution then. Uh, yes it makes a difference. The camera roll consists of individual images and videos that are parsed anytime the camera app is opened. Photos synced through iTunes are stored in a special photo database that is fast and of course has no effect on the camera app. The camera app is effected by a ton of photos and videos in the camera roll: it slows down the app, ergo the time you can take first shot. But if you’re starting up the camera to take a shot, then thumbnails shouldn’t even come into play. That load should only happen when you actually want the thumbnails. The camera function should be independent. Common sense would indicate that, but that is not how it is. It sorts all the photos and vids so it can show the ONE thumbnail that is displayed while taking a pic/vid. The more the images it has to sort, the longer it is before you can take a pic. Another stupid comment from @icebreaker. Solution works now for 3 people. Therefore, it must be stupid. Thanks Paul, I had 800+ photos/videos and the slow shutter was maddening. pps…. no, your analogy does not stink. It works wonderfully on windows. My bad. We should follow Apple’s planned obsolescence model for all things in life. Let’s start with the material ones. My house is a year and a half old, it’s obsolete, i’ve been in all of the rooms, need a new one. My car is about a year old, but the new model with Blueteeth came out, need a new one. My 80″ TV is obsolete now that there are 90″ 4K TVs, need a new one, etc. But why stop at these? My wife/girlfriend/husband/boyfriend is obsolete (got stale long time ago, last spring in fact), need a new one. My citizenship is getting tired (got it last year after a 20-year ordeal) time to move to Canada. Serving in the army sux since people are shooting at me with AK-47s the first night on deployment, time to switch to the navy and have people shoot at me with torpedoes instead, etc. Do we realize how ridiculous our behavior of instant gratification has become? And if you thought the adults were bad, look at our kids. You put a lot of thought and often effort to buy/build them a great toy. Ten minutes after unwrapping/unveiling it the toy is destroyed, scattered everywhere or already long time forgotten. Why do we even bother? You’re right. You should just shoot yourself in the face and put an end to all that misery. Interesting response to advocate suicide Jim. Your dedication to a corporation supersedes your concern for human beings. Apple’s ‘planned obsolescence’? I love this trollish line. Name one company in the mobile tech industry that takes LONGER to obsolete their products than Apple. The Damn 3GS, almost a 4 year old phone, will be getting a major update this month. Apple has the longer support in the business, but of course has limits because of the rapidly increasing pace of mobile tech. Maybe you should jump into the Android/Winphone side to see what obsolescence is really about. Nokia’s FLAGSHIP phone released a few months ago will NOT be getting the Win8 update this fall, and apps made specifically for the new OS will not be compatible with it. Woops. Android? It’s pretty much a guessing game if you will get any updates at all, let alone WHEN you’ll get them. I’m sorry, I’m sick and tired of Apple being singled out for ‘obsolescence’ when in reality they have the longest support for their mobile devices/OS in the industry- by far. Exactly correct V Div (is that your real name? – cool parents!) Alta Vista up the 2002 BBC documentary by Adam Curtis called “Century of the Self”. It will explain how Freud, but in particular his PR inventing nephew Fast Eddy Bernays is to this day totally manipulating us into buying horrific looking electronic watches to replace our less than one-year old too large electronic communication pocket computer devices. I tried this and it made no difference. My girlfriend and I both have an iPhone 4. My girlfriend has 400+ pictures and 150+ videos in her cameraroll and I have 17 pictures and 2 videos in my cameraroll. Her camera is ready in less than 2 seconds. This was the case pretty much within a few months. Apple uses cleverer tactics that simple planned obsolescence. The products are hyped like mad, which distracts from the fact that each incarnation uses old technology inferior to competitors’. They hype up the 3mp camera the next model will have while competitors are using 10 or 20mp ones, for instance. The software is very slow, camera takes ages to initialise as do most functions. Samsung Galaxy phones are lightning fast in comparison, switching instantly between apps, no delays. Perhaps the iphone 10 in a few years time will match technically the current non-Apple ones on the market. I thought you had passed Bob? I loved your music as did all my fraternity brothers at UGA back in the 80’s. Too bad you only made that one album “Legend” in your career. Samsung hardware may be faster to switch between apps, but can you honestly opine in your Jamaican heart-of-hearts that Android is a better user interface and base operating system than than iOS? Is switching hardware and operating systems a viable solution to improve the iPhone camera start-up time? now thats hard.. I just bought an iphon 7.. hardly have any photos on the phone may be 50 odd.. but it still takes hell of a time for the camera to load… can someone please help..!!!! !